Sinful Chocolate Mousse Cake – no flour required! This no flour chocolate cake is OVERLOADED with divine CHOCOLATE and melt in your mouth goodness. And like most recipes on gf and me, it’s surprisingly easy to make. Don’t be surprised if the neighbours come calling when it’s in the oven. It smells THAT good! 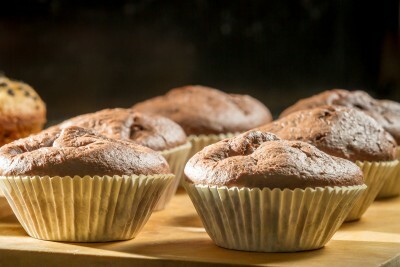 chocolate hazelnut cupcakes – made with hazelnut flour! Preheat oven to 375 degrees and lightly grease an 8 x 8 cake pan or muffin tin. Break chocolate into pieces and, along with the butter, place in a double boiler or in a pan on the melt setting on your stove top. Heat until melted, stirring often. Remove from heat and whisk sugar into chocolate mixture. Add eggs one at a time and whisk well after each one. I like to do this step with my electric mixer. Sift cocoa into mixture and whisk just until combined. Pour into pan and bake for 20 to 25 minutes. You want the top to form a thin crust. For mini-muffins, pour into greased or lined muffin tin and bake for 5-8 minutes. Regular muffins will take 18 – 20 minutes. TIP: Over baking will make this cake slightly dry- but it still tastes just as good! This cake is great on its own or you can top it with your own GF frosting (or try Duncan Hines Creamy Home Style Chocolate Icing – labelled Gluten free at the time of this posting). The cake also goes wonderfully with a scoop of luxurious vanilla ice cream. And unlike many gluten free baked items that have a very short shelf life, the sinful chocolate mousse cake actually tastes even better the next day. This entry was posted in Baking, Drinks & Desserts, Recipes and tagged Cake, Cupcake, flourless, gluten free. Bookmark the permalink. b) I tend to use 100% chocolate and let sugar / splenda / xylitol sweeten things up – have your tried this? c) Here in the UK, much cocoa is dutch process. Is this what you use? Hello! And thanks for visiting my site. This Chocolate Mousse Cake is really, really good! I use large eggs and usually Fry’s premium cocoa (a Cadbury UK product) and Bakers 100% pure unsweetened chocolate (Canadian) — mostly because these are readily available here. I sometimes use 4 oz. of raw organic cacao paste and 1/2 cup raw cacao powder – which makes it INCREDIBLE, but these are a little harder to come by and quite a bit more expensive. I like this recipe, thanks so much. I’m always on the lookout for GF options. Thanks for visiting my blog. Thanks. This is a good recipe – especially if you don’t have to be gluten free. You don’t have to buy any of the expensive flours! Like the recipe but was wondering how much time would it take in a gas oven, I don’t have a timer nor can i control heat more than the low,sim and high!!! I would love to try this so can you help plz!!!!! Good questions! I would try heating the oven on high to get it warm and then turning it to simmer while you’re baking. Without a temperature, it’s hard to say how long it will take but I can say that underdone is better than over. Hope that helps! Wow! Thanks so much. You’ve made my week! And thanks, too, for the correction on the oven timing. Thanks! Let me know how it goes. I know we love it! You’re very welcome! Hope you enjoy it as much as we do!